Well, headed home now, so I guess it’s time to reflect on this trip. First, the timing of the trip was unusual, coming only eight days after returning from Morocco with Carol. For sure, that’s a whole lot of traveling in a short time, so I was somewhat concerned about that. It worked out fine, though. I’m glad I’m not taking another major trip in eight days, but I don’t regret doing these two. Of course, South Africa would have been much more fun with Carol, but I think that her decision not to come was right for her. The trip itself was terrific. Nevada runs a great trip, includes a wide diversity of activities, and does it with a spirit of fun. Our small group of seven (plus Nevada and guide), was very compatible, with no real losers, and the guides were uniformly terrific, which is critical. The best days for me were in Lesotho, just moving through the spectacular landscape, observing life as we passed along. Beyond that, though, there were many memorable aspects to the trip. In no particular order, some that come to mind are spending time alone with a professional photographer in Joburg, the wonderful Origins Centre in Joburg, spending time with sangomas (faith healers), the quirky guy who built airplanes out of scrap, attending a Friday night synagogue service in Joburg, the market in which animal parts were sold to healers, witnessing the early morning baptisms in the sea in Durban, the Shembe religious service we went to, a day with the graffiti art expert, the visit to the Constitutional Court in Joburg, seeing the Mandela capture site sculpture and several very excellent art galleries. That’s a whole lot of memorable events in a pretty short time. I think I got a reasonable number of decent photographs. Each photography trip confirms for me that I’m just not interest in schlepping multiple camera bodies with six different lenses. Nor am I much interested in delving a lot deeper into the technology of photography, even though I recognize that that could improve the end product. I am interested, though, in learning techniques for capturing subjects in more usual ways. It continues to be an incredible privilege to be able to experience what I’m able to experience in the way I’m able to do it. I appreciate all of you who take the time to follow the blog and, especially, those of you who take the time to comment. 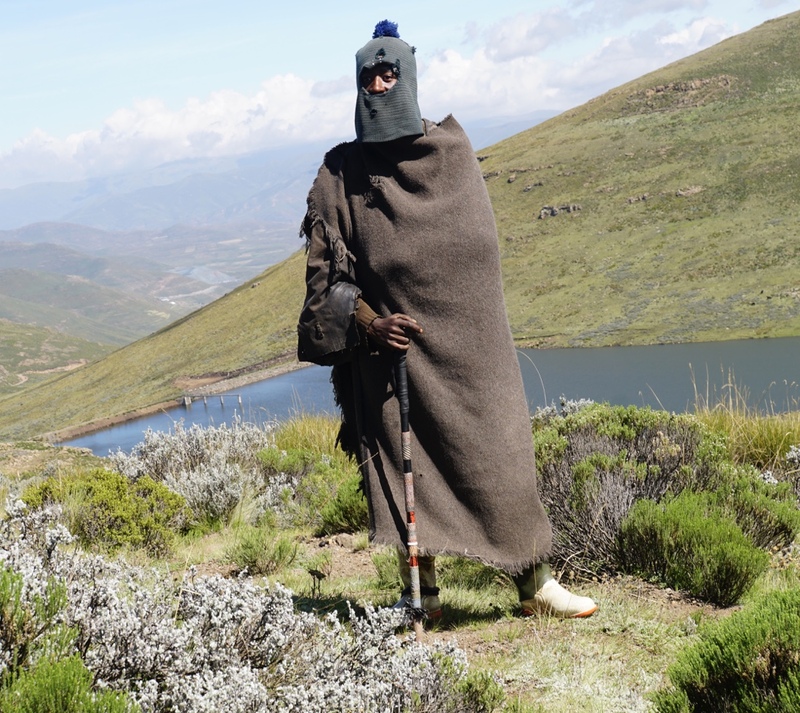 My friend, Gil Cornfield, often shares reactions and insights that go to the heart of what I experience, so I’ll close with this comment Gil wrote about my travels in Lesotho, “It is awe-inspiring to realize that those statuesque shepherds and we inhabit the same planet.” Yes, it is. And as long as I can experience awe in traveling, count me in.